Now, if I would have to define physics at this very moment, I’d say that physics is all about solving differential equations and complex integration. Let’s be honest: is there any page in any physics textbook that does not have any ∫ or ∂ symbols on it? When everything is said and done, I guess that’s the Big Lie behind all these popular books, including Penrose’s Road to Reality. You need to learn how to write and speak in the language of physics to appreciate them and, for all practical purposes, the language of physics is math. Period. I am also painfully aware of the fact that the type of differential equations I had to study as a student in economics (even at the graduate or Master’s level) are just a tiny fraction of what’s out there. The variety of differential equations that can be solved is truly intimidating and, because each and every type comes with its own step-by-step methodology, it’s not easy to remember what needs to be done. Worse, I actually find it quite difficult to remember what ‘type’ this or that equation actually is. In addition, one often needs to reduce or rationalize the equation or – more complicated – substitute variables to get the equation in a form which can then be used to apply a certain method. To top if all off, there’s also this intimidating fact that – despite all these mathematical acrobatics – the vast majority of differential equations can actually not be solved analytically. Hence, in order to penetrate that area of darkness, one has to resort to numerical approaches, which I have yet to learn (the oldest of such numerical methods was apparently invented by the great Leonhard Euler, an 18th century mathematician and physicist from Switzerland). So where am I actually in this mathematical Wonderland? I’ve looked at ordinary differential equations only so far, i.e. equations involving one dependent variable (usually written as y) and one independent variable (usually written as x or t), and at equations of the first order only. So that means that (a) we don’t have any ∂ symbols in these differential equations (let me use the DE abbreviation from now on) but just the differential symbol d (so that’s what makes them ordinary DEs, as opposed to partial DEs), and that (b) the highest-order derivative in them is the first derivative only (i.e. y’ = dy/dx). Hence, the only ‘lower-order derivative’ is the function y itself (remember that there’s this somewhat odd mathematical ‘convention’ identifying a function with the zeroth derivative of itself). a1(t) y'(t) + a0(t) y(t) = q(t). So, besides y(t) and y'(t) – whose functional form we don’t know because (don’t forget!) finding y(t) is the objective of solving these DEs 🙂 – we have three other random functions of the independent variable t here, namely a1(t), a0(t) and q(t). Now, these functions may or may not be linear functions of t (they’re probably not) but that doesn’t matter: the important thing – to qualify as ‘linear’ – is that (1) y(t) and y'(t), i.e. the dependent variable and its derivative, appear in a linear combination and have these ‘coefficients’ a1(t) and a0(t) (which, I repeat, may be constants but, more likely, will probably be functions of t themselves), and (2) that, on the other side of the equation, we’ve got this q(t) function, which also may or – more likely – may not be a constant. The notion of ‘separable’ refers to the fact that we can neatly separate out the terms involving y and x respectively, in order to then bring them on the left- and right-hand side of the equation respectively (cf. the G(y) y‘ = F(x) form), which is what we’ll need to do to solve the equation. I’ve been rather vague on that ‘integrating factor’ we use to solve linear equations – for the obvious reason that it’s not all that simple – but, in contrast, solving separable equations is very straightforward. We don’t need to use an integrating factor or substitute something. We actually don’t need any mathematical acrobatics here at all! We can just ‘separate’ the variables indeed and integrate both sides. OK. You’re with me. In fact, you’re ahead of me and you’ll say: Hey! Hold it! P(x)dx + Q(y)dy is a linear combination as well, isn’t it? So we can look at this as a linear DE as well, isn’t it? And so why wouldn’t we use the other method – the one with that factor thing? Well… No. Go back and read again. We’ve got a linear combination of the differentials dx and dy here, but so that’s obviously not a linear combination of the derivative y’ and the function y. In addition, the coefficient in front of dy is a function in y, i.e. a function of the dependent variable, not a function in x, so it’s not like these an(x) coefficients which we would need to see in order to qualify the DE as a linear one. So it’s not linear. It’s separable. Period. […] Oh. I see. But are these non-linear things allowed really? […] OK. Got it. Please carry on. or, as you will also see it, dy/dx = M(x, y)/N(x, y) (use whatever letter you want). We can then find U(x, y), of course, by integrating P or Q. And then we just write that dU = P(x, y) dx + Q(x, y) dy = Ux dx + Uy dy = 0 and, because we’ve got the functional form of U, we’ll get, once again, an implicit function in y and x, which we may or may not be able to solve for y(x). So, we’ve got three different types of first-order DEs here: linear, separable, and exact. Are there any other types? Well… Yes. That being said, it’s also quite probable that a good substitution of the variable could make it ‘fit’. In addition, we have not exhausted our typology of first-order DEs as yet and, hence, we’ve not exhausted our repertoire of methods to solve them either. For example, if we would find that the conditions for exactness for the equation P(x, y) dx + Q(x, y) dy = 0 are not fulfilled, we could still solve that equation if another condition would turn out to be true: if the functions P(x, y) and Q(x, y) would happen to be homogeneous, i.e. P(x, y) and Q(x, y) would both happen to satisfy the equality P(ax, ay) = ar P(x, y) and Q(ax, ay) = ar Q(x, y) (i.e. they are both homogeneous functions of degree r), then we can use the substitution v(x) = y/x (i.e. y = vx) and transform the equation into a separable one, which we can then solve for v.
Hmm… OK. What’s next? That condition of homogeneity which we are imposing here is quite restrictive too, isn’t it? It is: the vast majority of M(x, y) and N(x, y) functions will not be homogeneous and so then we’re stuck once again. But don’t worry, the mathematician’s repertoire of substitutions is vast, and so there’s plenty of other stuff out there which we can try – if we’d remember it at least 🙂 . OK. I understand you’ve had enough by now. So what’s next? Well, frankly, this is not so bad as far as first-order differential equations go. I actually covered a lot of terrain here, although Mathews and Walker go much and much further (so don’t worry: I know what to do in the days ahead!). The thing now is to get good at solving these things, and to understand how to model physical systems using such equations. But so that’s something which is supposed to be fun: it should be all about “discovering why things fall to the ground, how sound travels through walls and how many wonderful inventions exist thanks to physics” indeed. Too bad that, in order to do that, one has to do quite some detour! Post Scriptum: The term ‘homogeneous’ is quite confusing: there is also the concept of linear homogeneous differential equations and it’s not the same thing as a homogeneous first-order differential equation. I find it one of the most striking examples of how the same word can mean entirely different things even in mathematics. What’s the difference? Well… A homogeneous first-order DE is actually not linear. See above: a homogeneous first-order DE is an equation in the form dy/dx = M(x, y)/N(x, y). In addition, there’s another requirement, which is as important as the form of the DE, and that is that M(x, y) and N(x, y) should be homogeneous functions, i.e. they should have that F(ax, ay) = ar F(x, y) property. In contrast, a linear homogeneous DE is, in the first place, a linear DE, so it’s general form must be L(y) = an(x) y(n) + an-1(x) y(n-1) + … + a1(x) y’ + a0(x) y = q(x) (so L(y) must be a linear combination whose terms have coefficients which may be constants but, more often than not, will be functions of the variable x). In addition, it must be homogeneous, and this means – in this context at least – that q(x) is equal to zero (so q(x) is equal to the constant 0). So we’ve got L(y) = 0 or, if we’d use the y’ + F(x) y = G(x) formulation, we have y’ + F(x) y = 0 (so that G(x) function in the more general form of a linear first-order DE is equal to zero). So is this yet another type of differential equation? No. A linear homogeneous DE is, in the first place, linear, 🙂 so we can solve it with that method I mentioned above already, i.e. we should introduce an integrating factor. 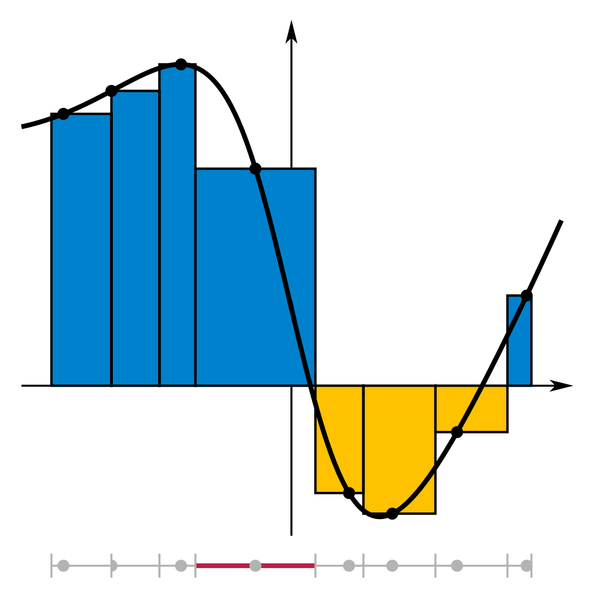 An integrating factor is a new function λ(x), which helps us – after we’ve multiplied the whole equation with this λ(x) – to solve the equation. However, while the procedure is not difficult at all, its explanation is rather lengthy and, hence, I’ll skip that and just refer my imaginary readers here to the Web. But, now that we’re here, let me quickly complete my typology of first-order DEs and introduce a generalization of the (first) notion of homogeneity, and that’s isobaric differential equations. An isobaric DE is an equation which has the same general form as the homogeneous (first-order) DE, so an isobaric DE looks like dy/dx = F(x, y), but we have a more general condition than homogeneity applying to F(x, y), namely the property of isobarity (which is another word with multiple meanings but let us not be bothered by that). An isobaric function F(x, y) satisfies the following equality: F(ax, ary) = ar-1F(x, y), and it can be shown that the isobaric differential equation dy/dx = F(x, y), i.e. a DE of this form with F(x, y) being isobaric, becomes separable when using the y = vxr substitution. Let me wrap up by noting that we also have the so-called Clairaut equations as yet another type of first-order DEs. Clairaut equations are first-order DEs in the form y – xy’ = F(y’). When we differentiate both sides, we get y”(F'(y’) + x) = 0. Now, this equation holds if (i) y” = 0 or (ii) F'(y’) + x = 0 (or both obviously). Solving (i), so solving for y” = 0, yields a family of (infinitely many) straight-line functions y = ax + b as the general solution, while solving (ii) yields only one solution, the so-called singular solution, whose graph is the envelope of the graphs of the general solution. The graph below shows these solutions for the square and cube functional forms respectively (so the solutions for y – xy’ = [y’]2 and y – xy’ = [y’]3 respectively). In any case, we’ve got quite a collection of first-order DEs now – linear, separable, exact, homogeneous, Bernouilli-type, isobaric, Clairaut-type, … – and so I think I should really stop now. Remember I haven’t started talking about higher-order DEs (e.g. second-order DEs) as yet, and I haven’t talked about partial differential equations either, and so you can imagine that the universe of differential equations is much and much larger than what this brief overview here suggests. Expect much more to come as I’ll dig into it! Post Scriptum 2: There is a second thing I wanted to jot down somewhere, and this post may be the appropriate place. Let me ask you something: have you never wondered why the same long S symbol (i.e. the summation or integration symbol ∫) is used to denote both definite and indefinite integrals? I did. I mean the following: when we write ∫f(x)dx or ∫[a, b] f(x)dx, we refer to two very different things, don’t we? Things that, at first sight, have nothing to do with each other. Well… Think about it. When we write ∫f(x)dx, then we actually refer to infinitely many functions F1(x), F2(x), F3(x), etcetera (we generally write them as F(x) + c, because they differ by a constant only) which all belong to the same ‘family’ because they all have the same derivative, namely that function f(x) in the integrand. So we have F1‘(x) = F2‘(x) = F3‘(x) = … = F'(x) = f(x). The graphs of these functions cover the whole plane, and we can say all kinds of things about them, but it is not obvious that these functions can be related to some sum, finite or infinite. Indeed, when we look for those functions by solving, for example, an integral such as ∫(xe6x+x5/3+√x)dx, we use a lot of rules and various properties of functions (this one will involve integration by parts for example) but nothing of that reminds us, not even remotely, of doing some kind of finite or infinite sum. On the other hand, ∫[a, b] f(x)dx, i.e. the definite integral of f(x) over the interval [a, b], yields a real number with a very specific meaning: it’s the area between point a and point b under the graph y = f(x), and the long S symbol (i.e. the summation symbol ∫) is particularly appropriate because the expression ∫[a, b] f(x)dx stands for an infinite sum indeed. That’s why Leibniz chose the symbol back in 1675! Let me give an example here. Let x be the distance which an object has traveled since we started observing it. Now, that distance is equal to an infinite sum which we can write as ∑v(t)Δt, . What we do here amounts to multiplying the speed v at time t, i.e. v(t), with (the length of) the time interval Δt over an infinite number of little time intervals, and then we sum all those products to get the total distance. If we use the differential notation (d) for infinitesimally small quantities (dv, dx, dt etcetera), then this distance x will be equal to the sum of all little distances dx = v(t)dt. So we have an infinite sum indeed which, using the long S (i.e. Leibniz’s summation symbol), we can write as ∑v(t)dt = ∑dx = ∫[0, t]v(t)dt = ∫[0, t]dx = x(t). The illustration below gives an idea of how this works. 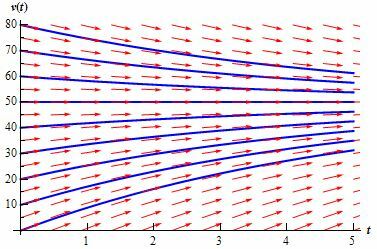 The black curve is the v(t) function, so velocity (vertical axis) as a function of time (horizontal axis). 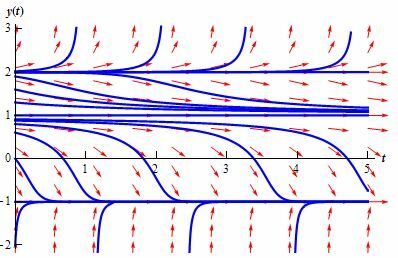 Don’t worry about the function going negative: negative velocity would mean that we allow our object to reverse direction. As you can see, the value of v(t) is the (approximate) height of each of these rectangles (note that we take irregular partitions here, but that doesn’t matter), and then just imagine that the time intervals Δt (i.e. the width of the rectangular areas) become smaller and smaller – infinitesimally small in fact. You have seen this formula, haven’t you? Except for the D-1f(x) notation of course. This Theorem tells us that, to solve the definite integral on the left-hand side, we should just (i) take an antiderivative of f(x) (and it really doesn’t matter which one because the constant c will appear two times in the F(b) – F(a) equation, as c — c = 0 to be precise, and, hence, this constant just vanishes, regardless of its value), (ii) plug in the values a and b, (iii) subtract one from the other (i.e. F(a) from F(b), not the other way around—otherwise we’ll have the sign of the integral wrong), and there we are: we’ve got the answer—for our definite integral that is. OK. You may think this is hairsplitting. What’s in a name after all? Or in a symbol in this case? Well… In math, you need to make sure that your notations make perfect sense and that you don’t write things that may be confusing. That being said, there’s actually a very good reason to re-use the long S symbol for indefinite integrals also. Huh? Why? You just said the definite and indefinite integral are two very different things and so that’s why you’d rather see that new D-1f(x) notation instead of ∫f(x)dx !? Well… Yes and no. 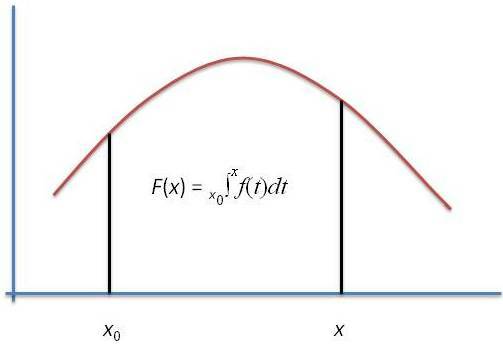 You may or may not remember from your high school course in calculus or analysis that, in order to get to that fundamental theorem of calculus, we need the following ‘intermediate’ result: IF we define a function F(x) in some interval [a, b] as F(x) = ∫[a, x] f(t)dt (so a ≤ x ≤ b and a ≤ t ≤ x) — so, in other words, we’ve got a definite integral here with some fixed value a as the lower boundary but with the variable x itself as the upper boundary (so we have x instead of the fixed value b, and b now only serves as the upper limit of the interval over which we’re defining this new function F(x) here) — THEN it’s easy to show that the derivative of this F(x) function will be equal to f(x), so we’ll find that F'(x) = f(x). In other words, F(x) = ∫[a, x] f(t)dt is, quite obviously, one of the (infinitely many) antiderivatives of f(x), and if you’d wonder which one, well… That obviously depends on the value of a that we’d be picking. So there actually is a pretty straightforward relationship between the definite and indefinite integral: we can find an antiderivative F(x) + c of a function f(x) by evaluating a definite integral from some fixed point a to the variable x itself, as illustrated below. So here we go: Chapter 1, on Differential Equations. Of course, I mean ordinary differential equations, so things with one dependent and one independent variable only, as opposed to partial differential equations, which have partial derivatives (i.e. terms with δ symbols in them, as opposed to the d used in dy and dy) because there’s more than one independent variable. We’ll need to get into partial differential equations soon enough, if only because wave equations are partial differential equations, but let’s start with the start. m(dv/dt) = F(t, v) = mg – γv(t). Note the peculiarity of this F(t, v) function: in the end, we will want to write v(t) as an explicit function of t, but so here we write F as a function with two separate arguments t and v. So what depends on what here? What does this equation represent really? Well… The equation does surely not represent one or the other implicit function: an implicit function, such as x2 + y2 = 1 for example (i.e. the unit circle), is still a function: it associates one of the variables (usually referred to as the value) to the other variables (the arguments). But, surely, we have that too here? No. If anything, a differential equation represents a family of functions, just like an indefinite integral. Indeed, you’ll remember that an indefinite integral ∫f(x)dx represents all functions F(x) for which F'(x) = dF(x)/dx = f(x). These functions are, for a very obvious reason, referred to as the anti-derivatives of f(x) and it turns out that all these antiderivatives differ from each other by a constant only, so we can write ∫f(x)dx = F(x) + c, and so the graphs of all the antiderivatives of a given function are, quite simply, vertical translations of each other, i.e. their vertical location depends on the value of c. I don’t want to anticipate too much, but so we’ll have something similar here, except that our ‘constant’ will usually appear in a somewhat more complicated format such as, in this example, as v(t) = 50 + ce—0.196t. So we also have a family of primitive functions v(t) here, which differ from each other by the constant c (and, hence, are ‘indefinite’ so to say), but so when we would graph this particular family of functions, their vertical distance will not only depend on c but also on t. But let us not run before we can walk. The thing to note – and to always remember when you’re looking at a differential equation – is that the equation itself represents a world of possibilities, or parallel universes if you want :-), but, also, that’s it in only one of them that things are actually happening. That’s why differential equations usually have an infinite number of general (or possible) solutions but only one of these will be the actual solution, and which one that is will depend on the initial conditions, i.e. where we actually start from: is the object at rest when we start looking, is it in equilibrium, or is it somewhere in-between? So that’s the first thing you should note about these direction fields: we’re trying to understand what is going on with these graphs and so we identify the dependent variable with the y axis and the independent variable with the x axis, in line with the general convention that such graphs will usually depict a y = y(x) relationship. In this case, we’re interested in the velocity of the object (not its position), and so v = v(t) is the variable on the y axis of that first graph. So we start at point zero with zero velocity but so now we’ve got the force F with us. 🙂 Hence, the object’s velocity v(t) will not stay zero. As the clock ticks, its movement will respect Newton’s Law, i.e. m(dv/dt) = F(t, v), which is m(dv/dt) = mg – γv(t) in this case. Now, if we plug in the above-mentioned values for m and γ (as well as the 9.8 approximation for g), we get dv(t)/dt = 9.8 – 0.196v(t) (we brought m over to the other side, and so then it becomes 1/m on the right-hand side). Now, let’s insert some values into these equation. Let’s first take the value v(0) = 0, i.e. our point of departure. We obviously get d(v(0)/dt = 9.8 – 0.196.0 = 9.8 (so that’s close to 10 but not quite). Let’s take another value for v(0). If v(0) would be equal to 30 m/s (this means that the object is already moving at a speed of 30 m/s when we start watching), then we’d get a value for dv/dt of 3.92, which is much less – but so that reflects the fact that, at such speed, air resistance is counteracting gravity. Let’s take yet another value for v(0). Let’s take 100 now for example: we get dv/dt = – 9.8. OK. Enough of that kids’ stuff now. What’s the point? Well, it’s these values for dv/dt (so these values of 9.8, 3.92, -9.8 etcetera) that we use for that direction field, or slope field as it’s often referred to. Note that we’re currently considering the world of possibilities, not the actual world so to say, and so we are contemplating any possible combination of v and t really. So that slope field, or direction field, i.e. all of these little red arrows, represents the fact that the world of possibilities, or all parallel universes which may exist out there, have one thing in common: they all need to respect Newton or, at the very least, his m(dv/dt) = mg – γv(t) equation which, in this case, is dv(t)/dt = 9.8 – 0.196v(t). 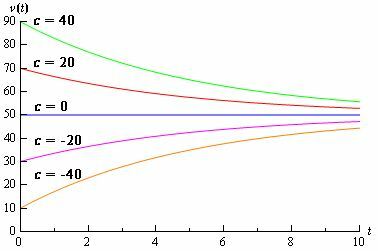 So, wherever we are in this (v, t) space, we look at the nearest arrow and it will tell us how our speed v will change as a function of t.
As you can see from the graph, the slope of these little arrows (i.e. dv/dt) is negative above the v(t) = 50 m/s line, and positive underneath it, and so we should not be surprised that, when we try to calculate at what speed dv/dt would be equal to zero (we do this by writing 9.8 – 0.196v(t) = 0), we find that this is the case if and only if v(t) = 9.8/0.196 = 50 indeed. So that looks like the stable situation: indeed, you’ll remember that derivatives reflect the rate of change, and so when dv/dt = 0, it means the object won’t change speed. Now, the dynamics behind the graph are obviously clear: above the v(t) = 50 m/s line, the object will be slowing down, and underneath it, it will be speeding up. At the v(t) line itself, the gravity and air resistance forces will balance each other and the object’s speed will be constant – that is until it hits the earth of course :-). So now we can have a look at these blue lines on the graph. 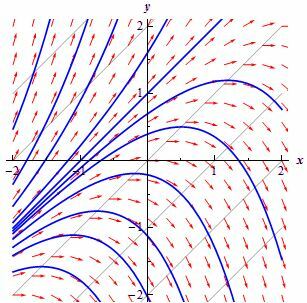 If you understood something of the lengthy story about the red arrows above, then you’ll also understand, intuitively at least, that the blue lines on this graph represent the various solutions to the differential equation. Huh? Well. Yes. So that’s it really: the secret behind differential equations has been unlocked. There’s nothing more to it. A second post scriptum point to be made, perhaps, is my remark that solving that dv(t)/dt = 9.8 – 0.196v(t) equation is not as easy as it may look. Let me qualify that remark: it actually is an easy differential equation, but don’t make the mistake of just putting an integral sign in front and writing something like ∫(0.196v + v’) dv = ∫9.8 dv, to then solve it as 0.098 v2 + v = 9.8v + c, which is equivalent to 0.098 v2 – 8.8 v + c = 0. That’s nonsensical because it does not give you v as an implicit or explicit function of t and so it’s a useless approach: it just yields a quadratic function in v which may or may not have any physical interpretation. So should we, perhaps, use t as the variable of integration on one side and, hence, write something like ∫(0.196v + v’) dv = ∫9.8 dt? We then find 0.098 v2 + v = 9.8t + c, and so that looks good, doesn’t it? No. It doesn’t. That’s worse than that other quadratic expression in v (I mean the one which didn’t have t in it), and a lot worse, because it’s not only meaningless but wrong – very wrong. Why? Well, you’re using a different variable of integration (v versus t) on both sides of the equation and you can’t do that: you have to apply the same operation to both sides of the equation, whether that’s multiplying it with some factor or bringing one of the terms over to the other side (which actually mounts to subtracting the same term from both sides) or integrating both sides: we have to integrate both sides over the same variable indeed. But – hey! – you may remember that’s what we do when differential equations are separable, isn’t? And so that’s the case here, isn’t it?We’ve got all the y’s on one side and all the x’s on the other side of the equation here, don’t we? And so then we surely can integrate one side over y and the other over x, isn’t it? Well… No. And yes. For a differential equation to be separable, all the x‘s and all the y’s must be nicely separated on both sides of the equation indeed but all the y’s in the differential equation (so not just one of them) must be part of the product with the derivative. Remember, a separable equation is an equation in the form of B(y)(dy/dx) = A(x), with B(y) some function of y indeed, and A(x) some function of x, but so the whole B(y) function is multiplied with dy/dx, not just one part of it. If, and only if, the equation can be written in this form, we can (a) integrate both sides over x but (b) also use the fact that ∫[B(y)dy/dx]dx = ∫B(y)dy. So, it looks like we’re effectively integrating one part (or one side) of the equation over the dependent variable y here, and the other over x, but the condition for being allowed to do so is that the whole B(y) function can be written as a factor in a product involving the dy/dx derivative. Is that clear? I guess not. 😦 But then I need to move on.